Spring Term: Feasts, Fun and Lots of Learning. Spring term is underway and at Hedley park we are delighted to report that we are busy enjoying all that our unique environment has to offer. We truly are in a wonderful location and with the refurbishment of Merrion Square park in progress, our students are able to make the most of our historic, creative and natural environment. The renewed play and exploration area is most welcome and very popular when we go out on nature walks or just to burn off some excess energy. Being a well read bunch our students love the fact that the inspiration for the play area came from our much loved Oscar Wilde and his story of the Selfish Giant. Dublin City created a lovely illustrated version of the story if you’d like to explore it with your child at home. A big news story so far this terms has to be the receiving of our own copy of the 1916 Proclamation from the Irish Army Officials. In the preparatory school classes, the students are very aware of the historic and cultural significance of the upcoming centenary celebrations. The commencement of the republic as an independent nation has some resonance with them as they continue to work towards making their own independent place in the family, the classroom and indeed the world around them. The presentation itself was a wonderful experience for the whole school and was fittingly officiated by our most senior student. As a staff member its wonderful to see our students grow in stature, knowledge and independence from the 2yr old toddlers that come into the nursery to our 10 and 11yr old senior students, we have time to learn and grow with the student and their family. Child lead learning is key in any quality Montessori environment and that is in evidence everywhere in the Hedley Park experience. We can certainly say that in being part of the learning story of some of our more senior students we have learned about topics we as staff would otherwise never have approached. The child’s interests and questions lead their exploration of subjects and each child brings a unique perspective that we are honoured to ensure they develop and strengthen. This natural inquisitiveness, eagerness to be challenged and joy in learning is a trait of Montessori educated individuals long after they progress beyond our halls. 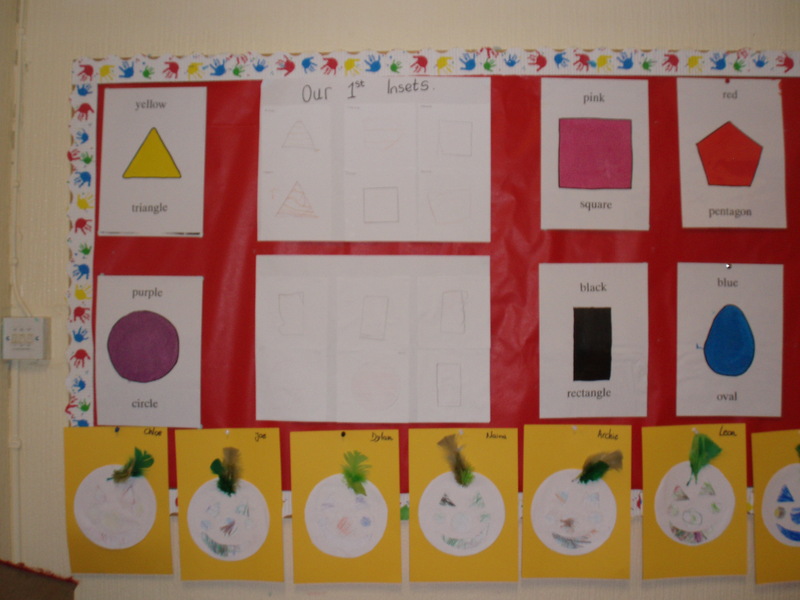 Our nursery class have been exploring many subjects, from Geography to Poetry, Natural Sciences to Maths. Of course the underlying core within all our classroom activities is the development of the individual learner and their own independence and confidence in their ability to learn. Children of this stage need to be active, involved and engaged with the topic. The need sensory input in order to establish the facts of the lesson deep within their schema of knowledge. What we mean by this as Montessori practitioners, is that children learning through the method don’t just parrot back rhymes of numbers, sounds and topics, but through the materials and lessons they can absorb the quantity, shape, weight, feeling, sound and concrete truth of the numbers, letters, and basic building blocks of the world around them. It is through the connection of the hand to feel, the eyes to see and the mind to comprehend that the child internalises the abstract idea and makes it real and useful to them for the rest of their life long learning. Our Junior class students are ready for some slight abstraction from the concrete learning of the nursery, but they are still very active and hands on in their quest for knowledge. In the early part of the spring term the group turned their attention to the continent of Australia. It’s a topic that students from the nursery will have already been introduced, however as the students have developed from nursery so have their interests and the learning at Junior Class level is deeper and more involved. Animals and the natural environment are intriguing to children of this age, being well versed in the natural landscape around them here in Ireland they are now intellectually capable of comparison with a new continent. This comparison to the known gives rise to the wonder and interest to explore further, coupled with a wealth of information sources at their disposal the child’s inner drive to learn is well rewarded. It is these positive formative experiences in learning that build a solid desire to learn that will remain within the child driving their learning and questioning for life. Our Senior Class students are well versed in the abstract, with a very solid knowledge and base at their feet they stride out into some unique and challenging subject areas. Spring term has witnessed deep exploration into what Montessori termed the “Great Lessons” these 5 groups of lessons explain how and why the earth, life and civilisation came to be. For a child, the Great Lessons spark the imagination and lead students to contemplate not only the past, but the future. It is through the telling (and re-telling) of these important cosmic lessons that students are motivated to further research and works in the Montessori classroom. Our seniors have been furthering their exploration of the second Great Lesson, Life Comes to Earth. Fascinated by the Era’s timeline the students have been using the materials available to create their own versions. Large work projects like this don’t just further the child’s subject knowledge, but deepens their independent working skills, self motivation, concentration, negotiation and in part team work. Watching a senior Montessori class like our is a joy, the learning and experiences are so varied and multi-layered, cross subject and skill development is naturally occurring in each moment of the day. Chinese New Year Feast – Emperor holds court. Our school community relish their extracurricular activities and classes, and in February it wasn’t just knowledge we were relishing, but yummy food in our Chinese New Year Banquet. Hosted by our Mandarin teacher the banquet has become a tradition of the Hedley Park calendar. This year we got the opportunity to make dumplings in the class and share them with our Emperor and Empress at the feast. It is a lovely occasion for the students and a very colourful and unique experience each year. Another extracurricular experience this spring, was a trip to the local amenity that is the National Concert Hall. We are privileged to have such national treasures on our doorstep and luckily we are in a position to enjoy them when possible. On this occasion the Junior and senior prep school classes were treated to a very hands-on and interactive workshop in music and percussion. 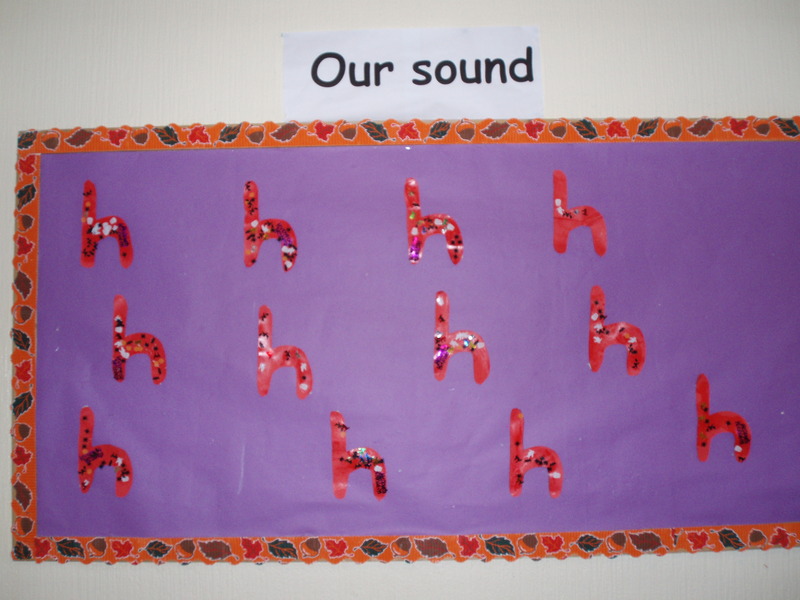 It was fantastic morning of sound and energy exploration that the children and their teachers thoroughly enjoyed. I have it on good authority that we will return for future workshops as it was a complete success. So ends our update from the first half of the spring term, we have many new lessons, and events coming in the second half of the term. Beginning with our Proclamation Day on the 16th March, more details on the calendar and in school. In the meantime please enjoy the gallery of our images from the Spring Term so far. Adventures in Space and lots more besides! We certainly took the new year to new heights! 2014 got off to a great start this January in Hedley Park, we went to the other side of the world, explored deepest space, went back to the land of the dinosaurs, and took a trip to meet the best young science minds in Ireland. Hands up! We love dinosaurs. super cool top thing to play with. 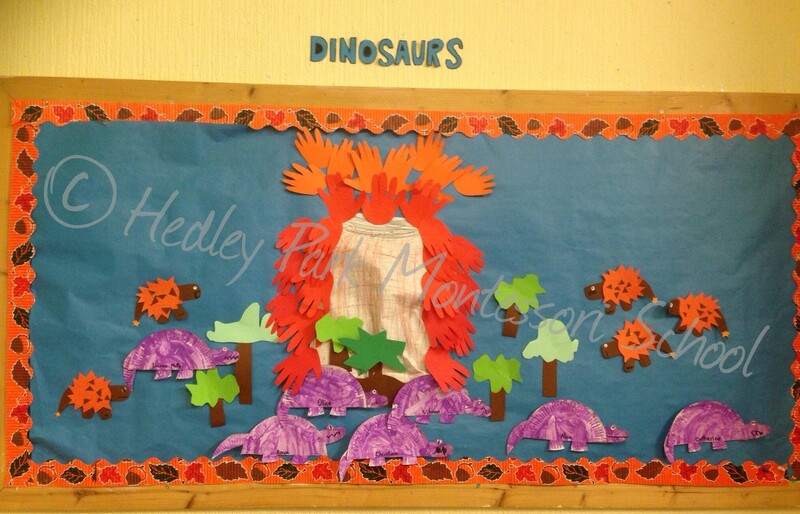 So we created a fantastic display complete with volcano, with lava hands and dinosaur group. Taking our interest in dinosaurs further our teachers helped us to recognise that dinosaur begins with the sound d. In Montessori classrooms we teach the children the sounds each letter makes rather than its name, this helps the child later on to begin to build words by working out each sound. We are growing so fast in the nursery our teachers wanted to celebrate that fact, each day we change and learn new things. It’s great to see our friends each day and find all the wonderful things to do in our class. 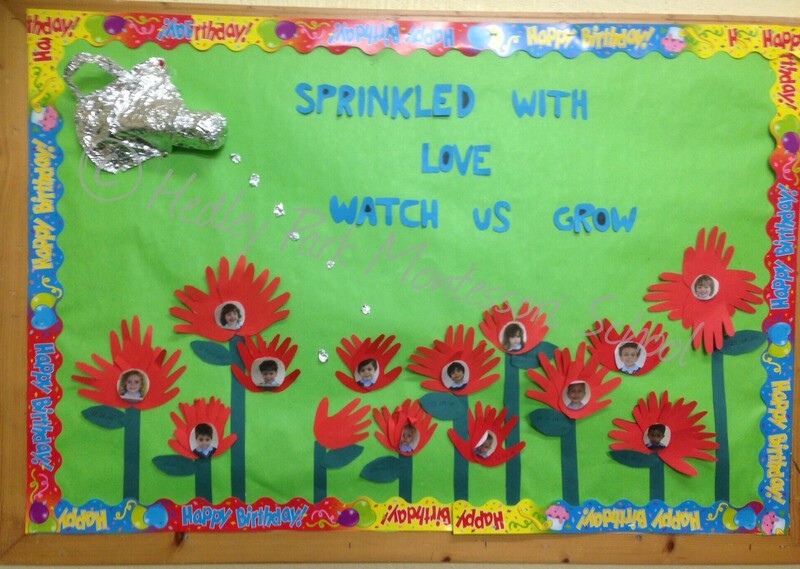 Blossoming in the Nursery Class. Thankfully at the end of the day there is always a story to help us wind down. Helping children to love reading is a real passion in Hedley and we have so many wonderful books and opportunities to enjoy a story on our own, in a small group or all together. 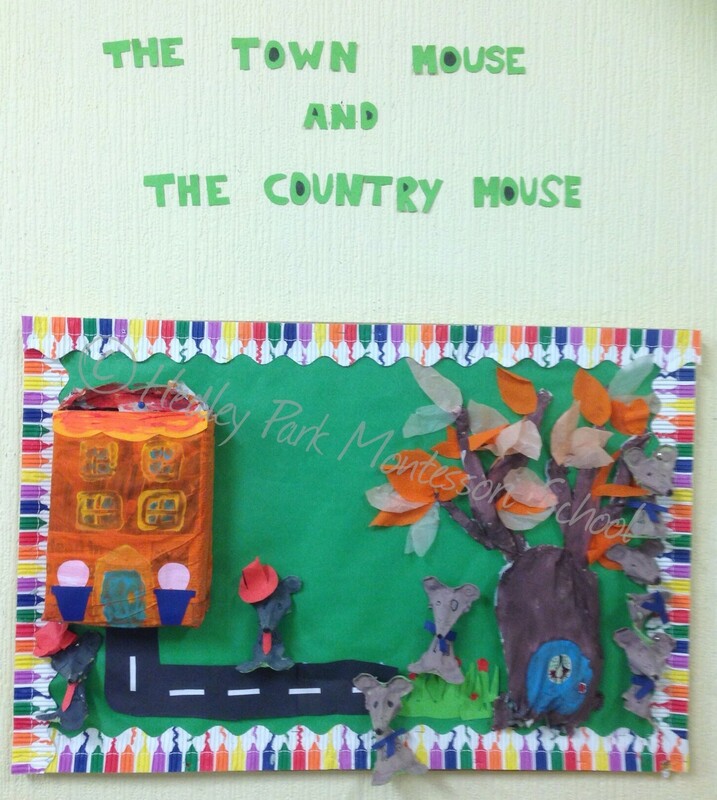 One of our favourite stories recently was Town Mouse and Country Mouse. 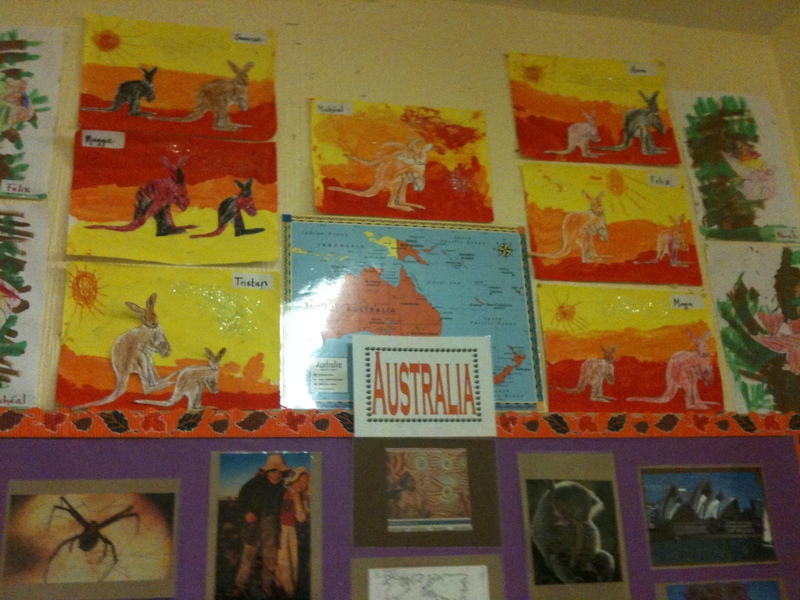 In the Junior class we also went on a trip to the continent of Australia. We really enjoyed looking at all the photos of Australia at this time of year. Imagine they have their christmas dinner on the beach, and right now they are preparing to go back to school after their summer holidays. That just blew us away. 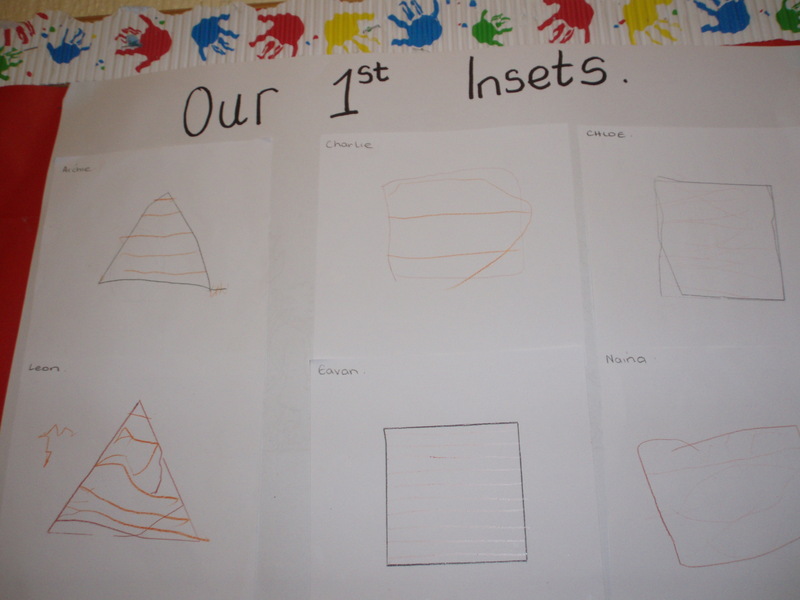 nursery class are perfected in the junior class. 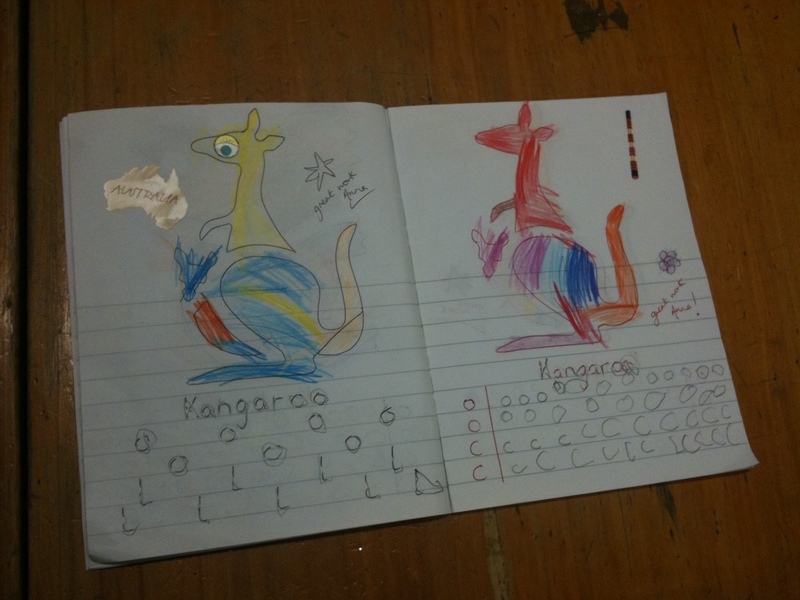 We enjoy practicing our sound writing and we are very proud of our K’s and P’s , Kangaroos, Koalas and Platypus were our inspiration. The final stop on our tour of Australia was a study of silhouette and horizon. We think you’ll agree they are magical. Last but not least our Senior class went on quite the tour, starting with a trip to the BT Young Scientist Exhibition on the 9th of January. We love the young scientist, its such an inspiration to meet all the older children and their projects alongside professional scientists all of whom had amazing things to show us. This inspired us to take on some experiments of our own, from physics to geometry. We hypothesised, predicted, observed and recorded many different ideas. Lots of work on materials and shapes help us discover how the world works, and what the properties of each matter are. Working on our literacy and creativity we enjoyed writing about “If I lived in a Snowglobe”. This fun imaginative exercise really got us thinking and you can see the results were captivating. Some of them are displayed for you to admire. Of course if you are a parent or relative of someone in the senior class you will have heard all about our adventures in space. We have spent wonderful times comparing and contrasting planet properties, sizes, shapes, temperatures. How light travels through space, in particular how the light of our sun creates night and day on earth. I’m sure you’ll agree we’ve been busy and the month isn’t even over yet! 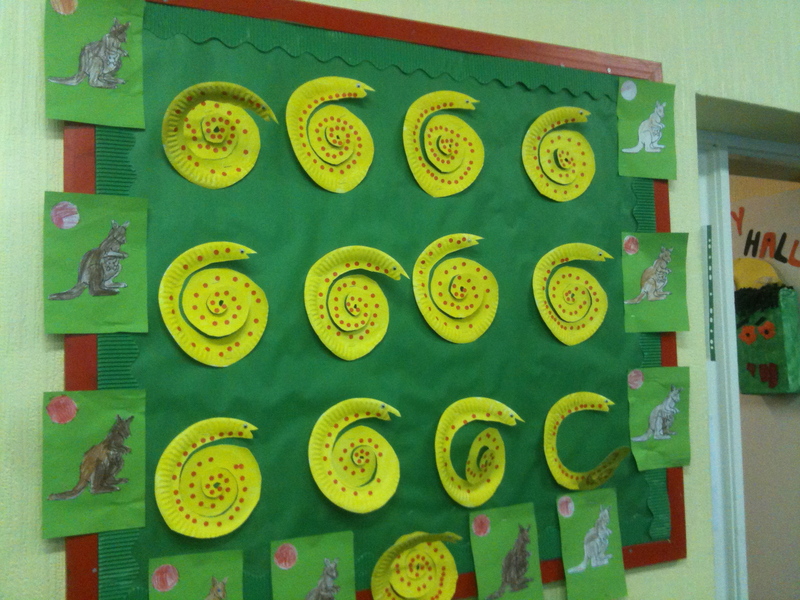 This week we are celebrating The Year of the Horse. We will have a traditional Chinese feast on Thursday after our last Mandarin class of the year of the snake. We will even have royalty visiting, with a special appearance of an Emperor and Empress. Come back soon to see how much fun we had. Trick or Treat! Our Witches Walk was good enough to eat! Who can believe the term is passing so quickly. Rested and ready for action we have been hard at work in the week since midterm break, but before we tell you all that’s planned we want to tell you all about our work before the break. We were fiendishly hard-working on our group project themes pre Halloween. Of course the obvious theme was everywhere, but each class also created some brilliant cross-curricular projects. The Haunted Tree says Recycle Please! 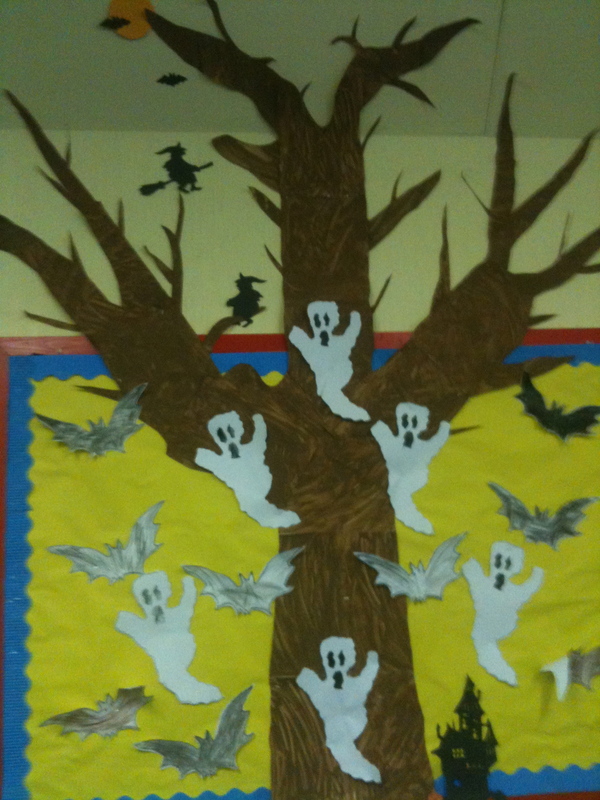 The senior class created a Haunted Recycling Tree, learning about recycling is very important to us in Hedley Park. Our pupils take great pride in caring for their environment. The Montessori method gently introduces the basics of caring for your environment at a very young age, from 2yrs old the children learn to clean up after themselves, put things away, care for plants and animals, building to looking after each other and their community. All this leads to the child becoming more aware of and confident in their ability to effect change and protect the natural world around them. Of course by the time they reach our senior class the children’s vision of the environment has grown from the home and classroom to the vast world around them. Recycling, Reducing and Reusing are all responsibilities the children take as given to ensure the planet is kept clean and habitable for all. 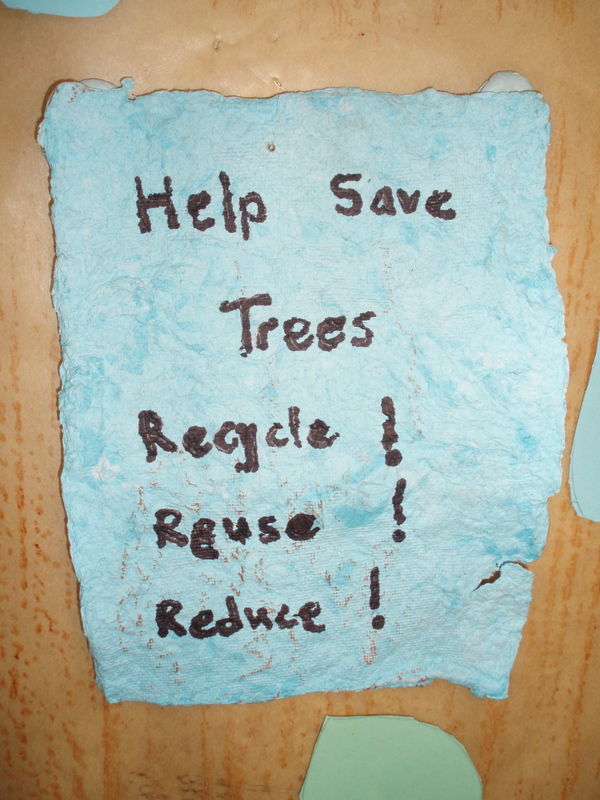 The class tried their hand at recycling paper of their own. The main project focused on the importance of trees to the ecosystem. Talking about the O2/CO2 cycle and all the benefits of trees to our ecology, the pupils decided to make a mural of a tree to illustrate their learning. The project incorporated science, art, botany, design, and great team effort. 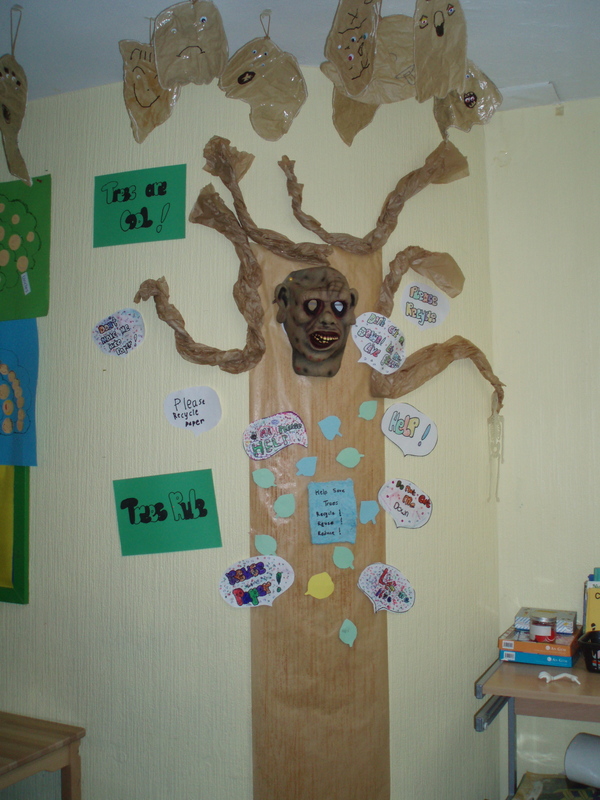 I love the way the fun and learning went hand in hand, and the tree became a haunted recycling tree. 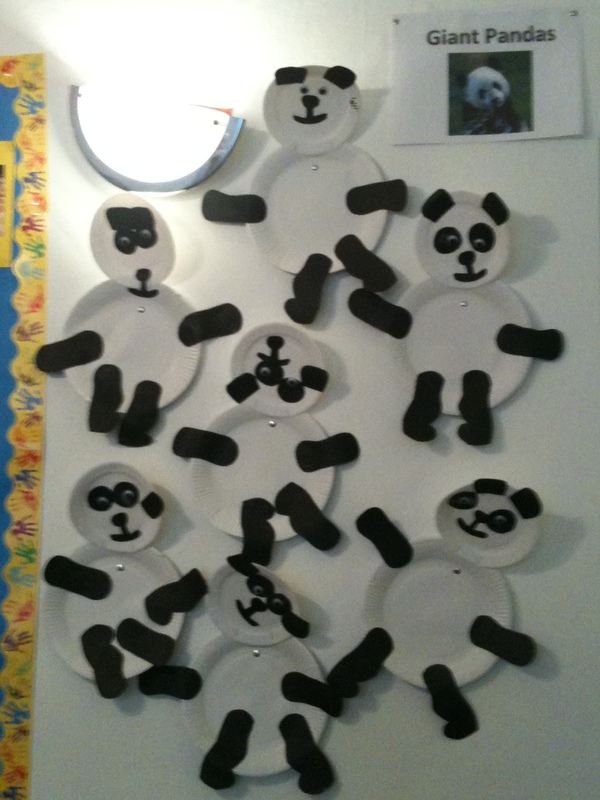 In an effort to inspire creative thinking Ashley set the class a challenge to create Swap-imals. Take your two favourite animals and combine them to create a new creature with the features of both. I really enjoyed the Hendor and the Lionphant! 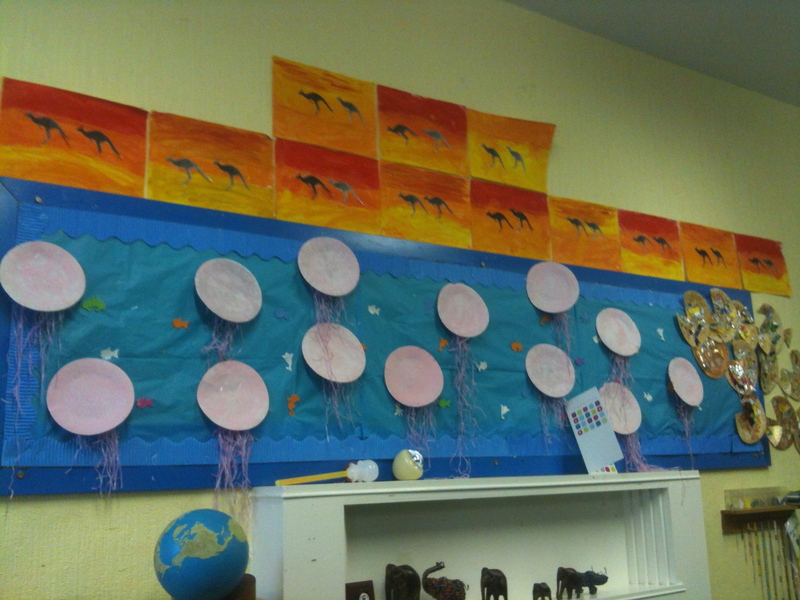 Moving to Aoife’s Junior and Senior infants Class, along side the seasonal discussions of autumn and Halloween, the class took a geographical and cultural trip to the continent of Australasia. The land down under was examined at circle time, with photos, stories, poetry and song all forming part of the learning. The children of Senior and Junior infants are very used to working with the wonderful Montessori geography materials such as the sandpaper and coloured globes and the jigsaw map of the world, at this age they are still very focused on absorbing as much new information as possible so culture packs and geography folders that spark conversation and further study are in constant use. Animals are still a popular study point for the pupils and with that in mind they worked on creating a super Great Barrier Reef that was fixed across the classroom. Jellyfish, piranhas and tiny reef plankton all featured. Outback kangaroos hopping through the desert sunset, furry koala’s and some aboriginal inspired snake art paid testimony to the areas of study the children undertook on their southern hemisphere odyssey. The season would not be complete without some wonderful handwriting samples. This time on the Halloween theme! Great industry went into these samples, with witching words a plenty and ghoulish graphics to illustrate. Katie didn’t hold back on spooking up the practical life area, and the children were very proud to show me their new work. Halloween spooning and transferring spiders using chopsticks, pouring witches brew, but by and far the most popular seemed to be the Vampire blood pouring. Not for the faint hearted I am assured! Last but not least we go to the smallest in the Hedley Park family. 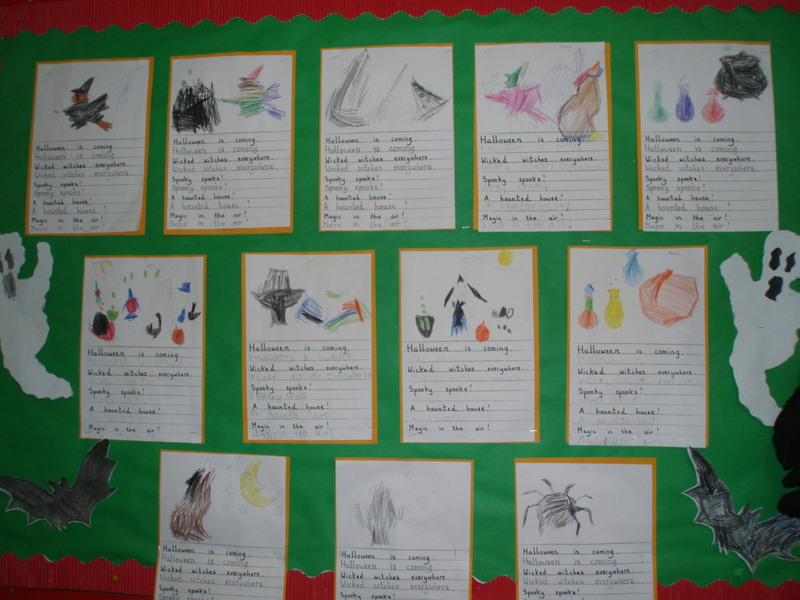 They were as to be expected exploring and absorbing from a vast array of materials and themes in October. The beauty of the Montessori approach at all ages is the child directed learning, each child choses for himself what to work with, for how long and with whom. The adults in the environment serve as guides, to give the perfect material to the child at the optimum time, informed by thorough observations of the child’s interests and aptitudes. 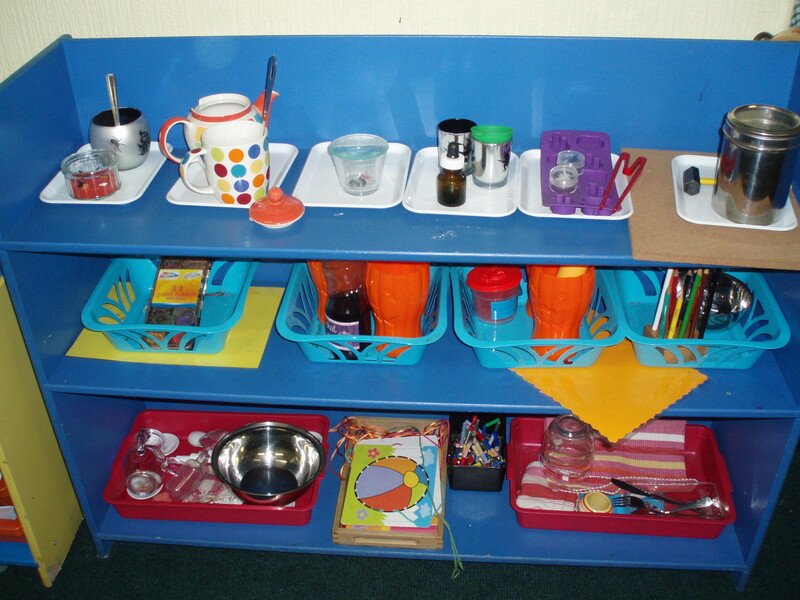 This creates a unique learning setting for the child and is so acutely observed to those who visit our classrooms, especially the nursery room. 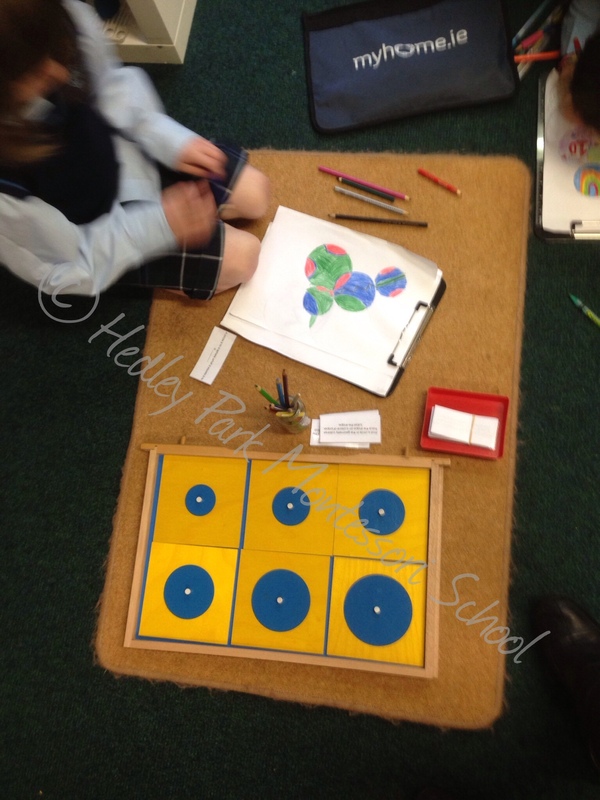 Gently guided towards the skills necessary for numeracy, literacy and logical thinking, the work focuses on increasing concentration, fine motor skills, sensory refinement and of course language rich interactions. A beautiful activity for refinement of the muscles of the hand, are the insets for design. Comprising all the forms and lines needed to write every letter and number they aid the child in establishing good pencil control and hand strength all while giving the child the “muscular memory” of creating the lines necessary to replicate letters at a later stage. Up close with the Insets. 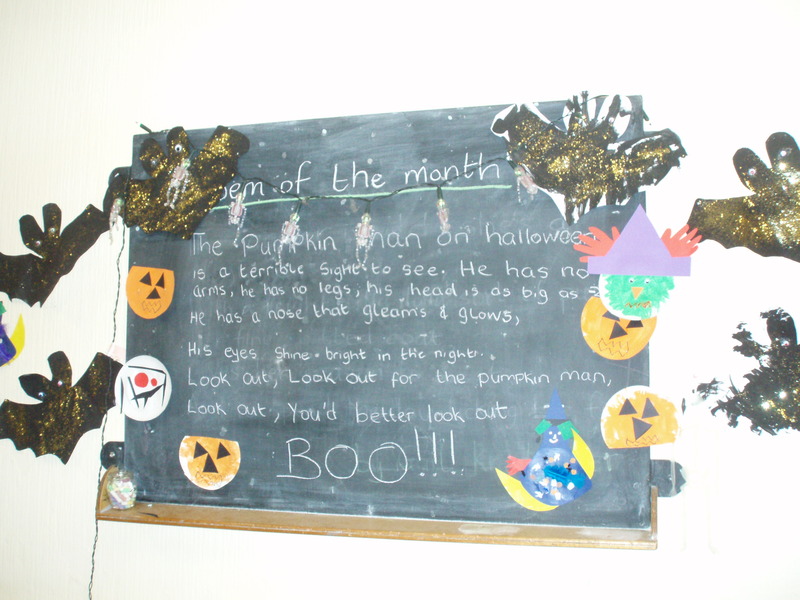 Seasonal crafts, poetry and our special sound were all in action too, the nursery made a colourful witch, bat and Halloween mask display to accompany their poem “The Pumpkin Man” all of which came together nicely with the sound which had to be “h” for Halloween. 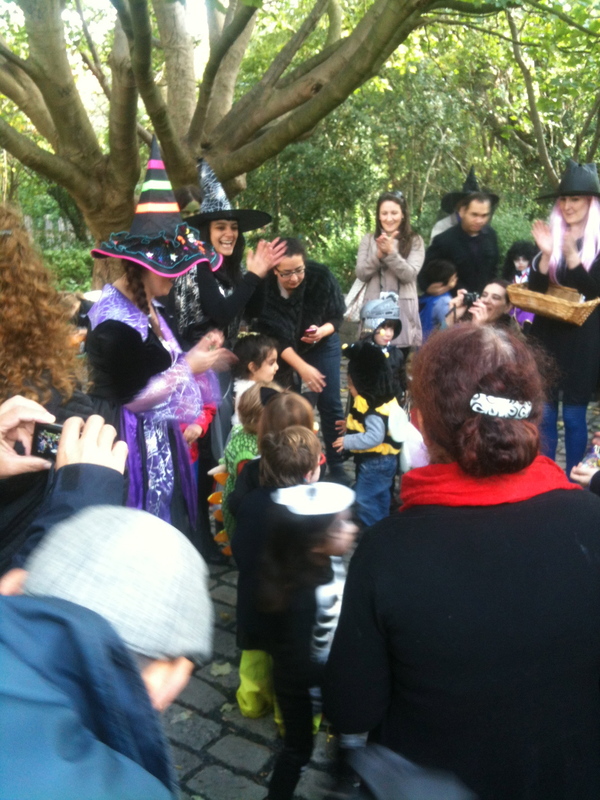 Finally, a quick recap of our special Witches Walk and Halloween mid term fun morning. 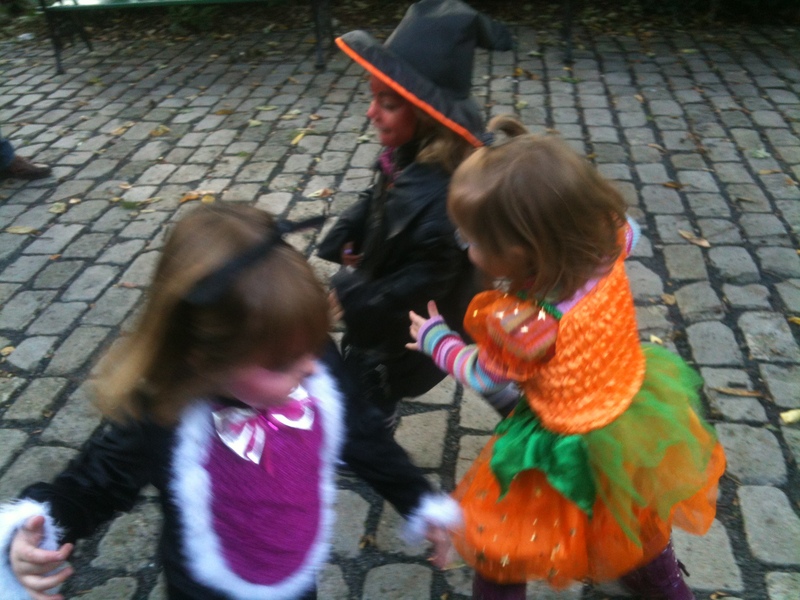 Costumes were donned, faces painted and everyone looked spooktacular by mid morning even the teachers got in on the act with Ashley dressing as a super strict headmistress, Katie as the Great Witch Katie, Aoife looked strikingly spooky in her witches cape and Magda and Eavan were the good witches of the nursery. Witch Katie held court, casting spells and daring only the brave to fish around in the “mummies brain” for a trick or treat surprise. 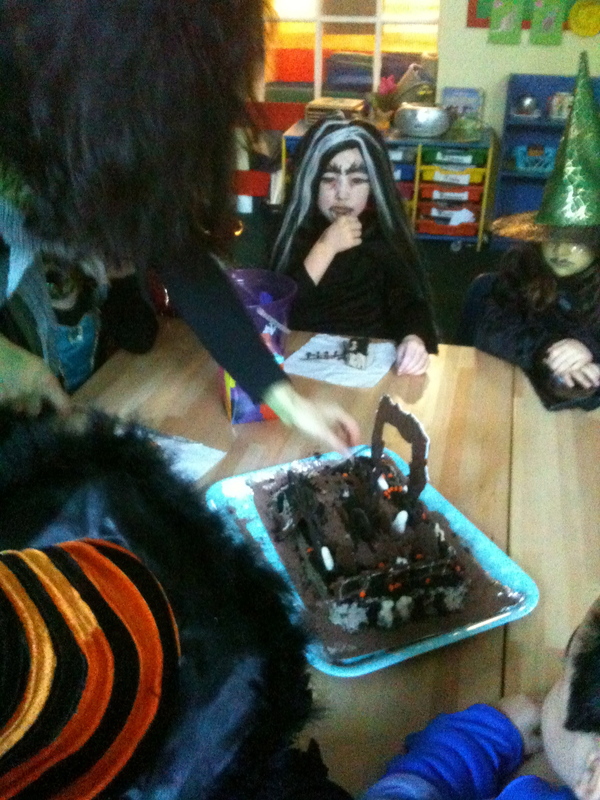 At snack Witch Aoife turned milk into vampires blood, and treated us all with the help of her class to a fearsome reading of The Witches poem and we got to eat a piece of the Graveyard Cake. Just when we were getting ready to go to the park, two wicked witches ran off into the park with our popcorn and apples and so a Witch-hunt was called for. 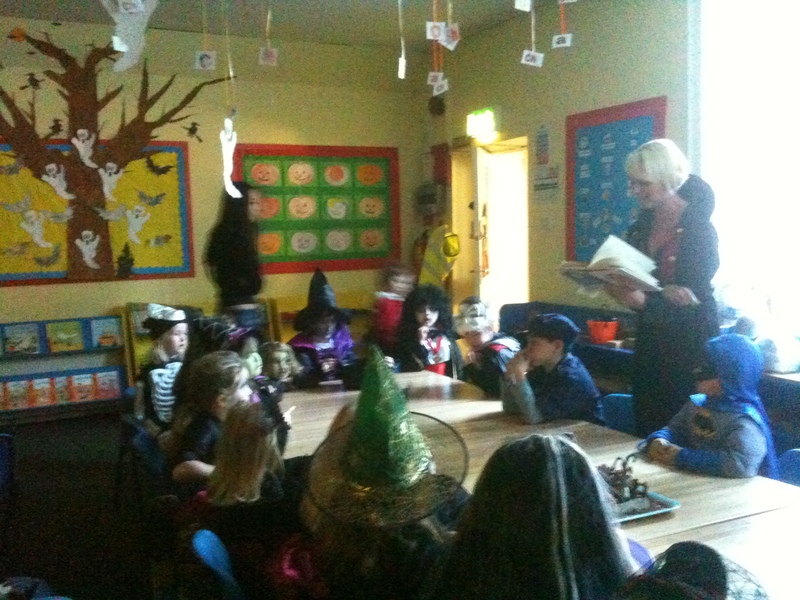 With the help of Witch Katie and our two Good Witches Eavan and Magda the children followed the clues and found those sneaky witches before they ate all the yummy healthy treats! Witch Katie then cast a spell and vanished for another year! We were all delighted to welcome Lisa back from maternity leave last week. Lisa was much missed but her bundle of joy Emily was worth us doing without Lisa for a few months. We look forward to Emily’s Hedley Park debut in a few years. Welcome back Lisa, and Luca too. We’ve had the return of some old friends in our class, and some new faces too. So we welcome our new members to the Hedley family and look forward to learning and growing with you all. The Cat, The Witch and The Pumpkin! With that we’ll get back to work. Lots of love from all of us in Hedley. “At last” we hear you cry! Yes the big school have taken a moment from their seriously busy days to tell you all about what they’ve been getting up to, and the first class to share their news is Junior Infants. 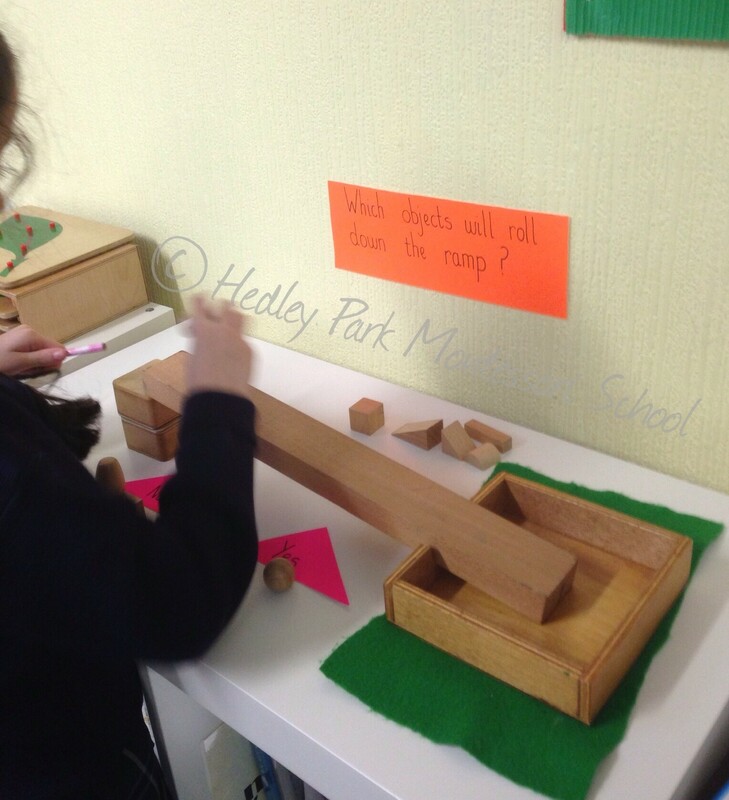 At Hedley Park we are very lucky to be one of the few pre and primary Montessori schools in the city center so our young students can continue their Montessori experience from nursery and preschool right through to sixth class. 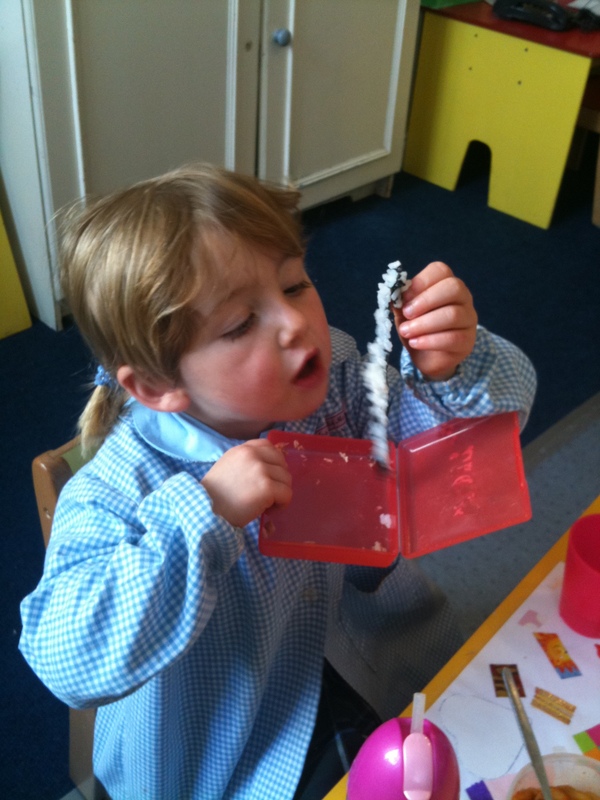 The national curriculum works hand in hand with the Montessori curriculum all the way, developing the child’s curiosity and intelligence alongside emotional and social awareness. The small classes and friendly staff give the school a ‘home away from home’ feel from which the children in our care thrive. As you have read in the preschool posts, Culture and Geography play a large part in the Montessori school syllabus. Each year the children learn about the seven continents, but the depth of knowledge and detail the child discovers grows deeper with each encounter, while still unifying all they have learned thus far. 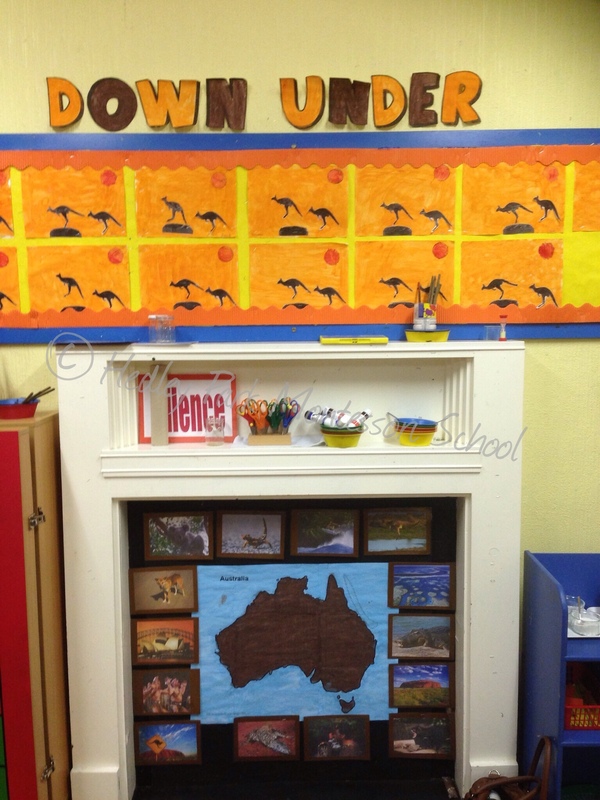 In Junior Infants they have begun their continental journey with Australia. 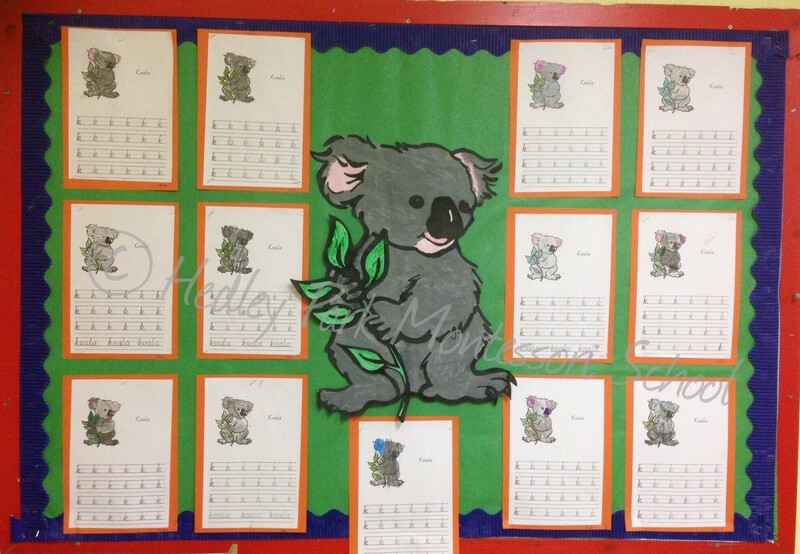 Similar to the preschool, learning through music, art and food are cornerstones, however the big kids in Junior Infants also work on great handwriting and stencilling relating to Australia. 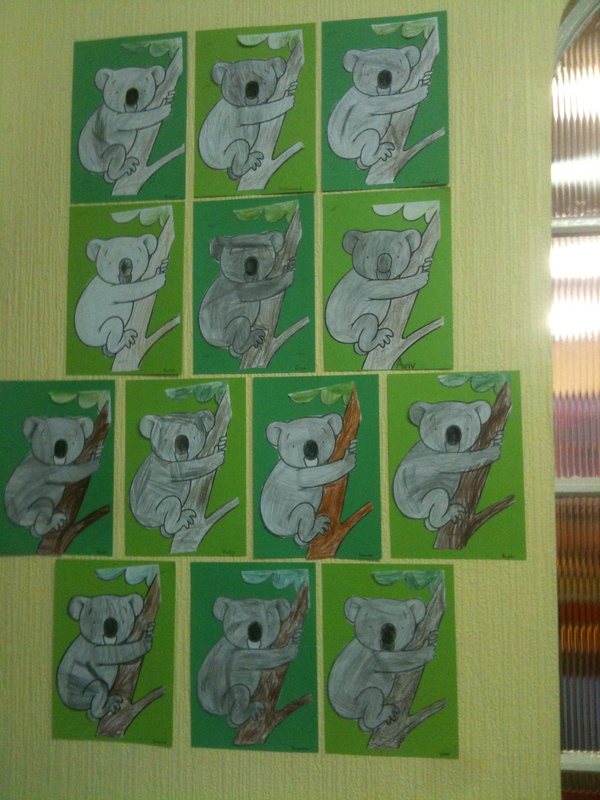 Thanks to Catriona they have lovely Kangaroo, Kookaburra & Koala stencils. This is doubly lucky as they are also doing the K sound! In P.E on Fridays they are learning how to move like the animals in Australia, and its no surprise that everyone loves to hop like the kangaroo! So expect some boingy junior infants hopping around the park on a sunny afternoon. 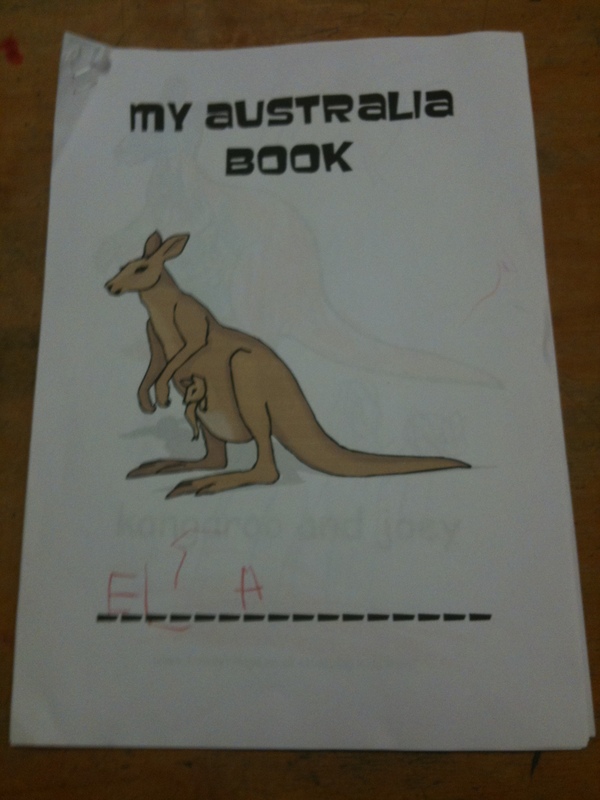 Other items parents will find coming home soon are the wonderful Australia books Katie made for the class full of colouring pages relating to Australia. Apart from being great fun to work on in class, these books help develop concentration, precision and colour work all the while strengthening those hand muscles for great handwriting. 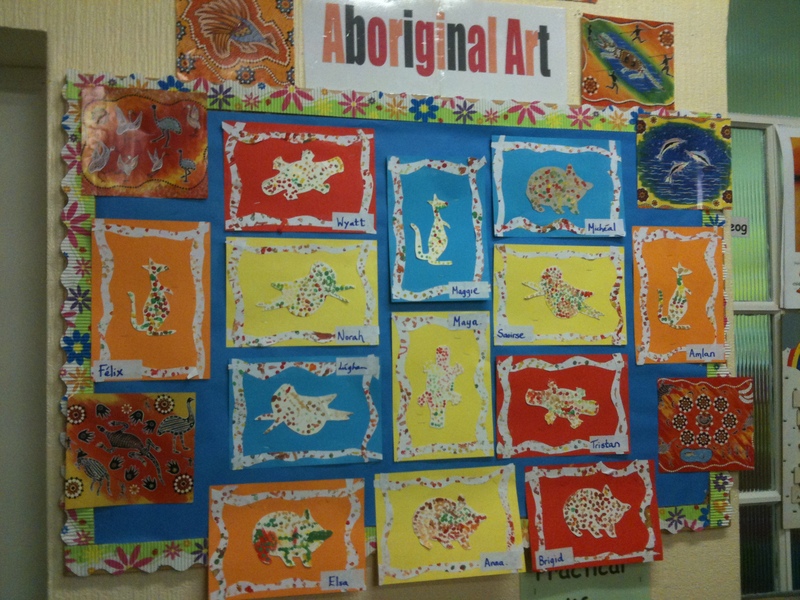 The final Art piece the Junior Infants wanted to show everyone, and rightly so, is their fantastic Aboriginal themed art. 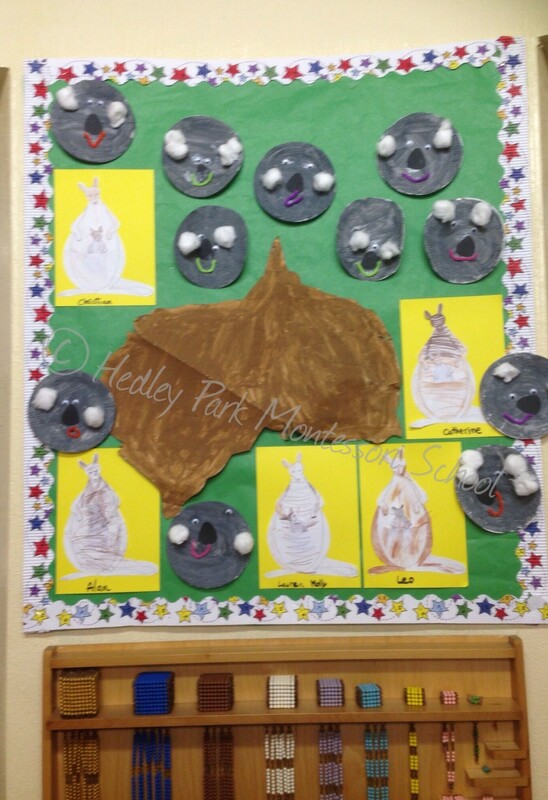 Kookaburras, Kangaroos, Platypuses and more are all beautifully decorated below. All the lovely art, handwriting, movement and song aside, I’m told that the highlight thus far was unsurprisingly the food! 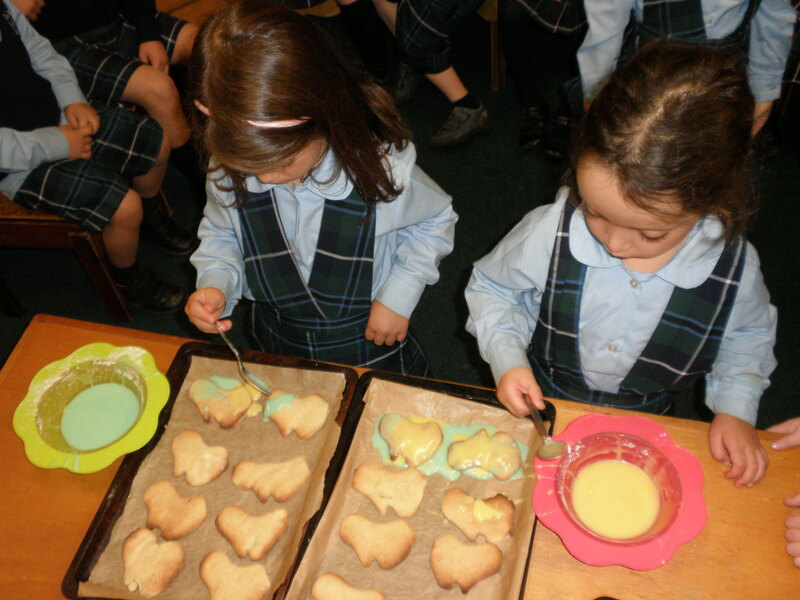 Junior Infants have tried all the jewels of aussie cuisine from Vegemite to TimTams, they even made Australia Cookies. Junior Infants Top Tips for Cooking! 1. Wash your hands with soap and water before starting your kitchen preparations. Continually wash hands as needed – after cracking an egg. 2. Re-read the recipe several times. 3. Make sure you have all of the necessary ingredients. Put them out on the counter. 4. Get out all of the equipment like pans and measuring cups and talk about how to use them safely. 5. Follow the recipe exactly. 6. Use oven mittens or pot holders when taking food in and out of the oven. So here is a photo of their handiwork! 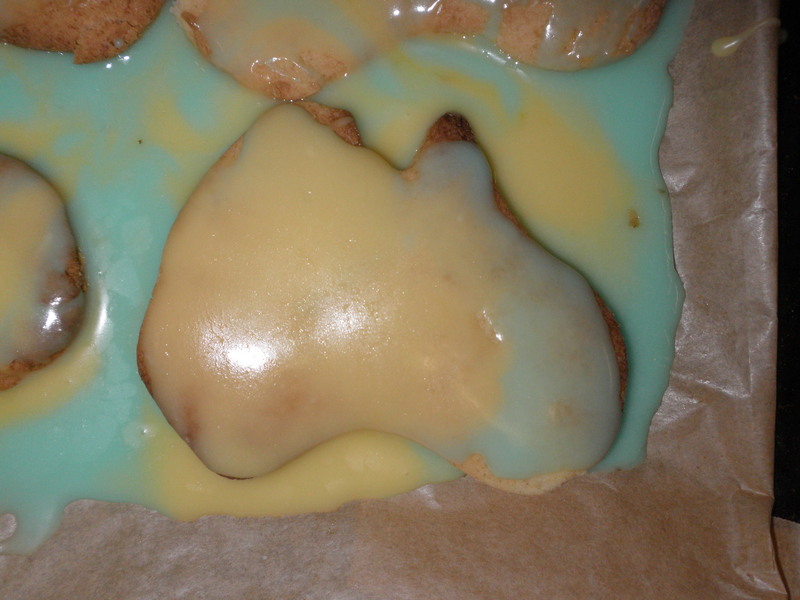 The shape is unmistakable but I have been told that the icing came out a bit runny. 🙂 Yellow was to represent the desert and bushland and the green for the woodland and rainforest. Next time our chefs say they will use rollout icing. Still I’m assured they were hands down the best tasting australias ever! 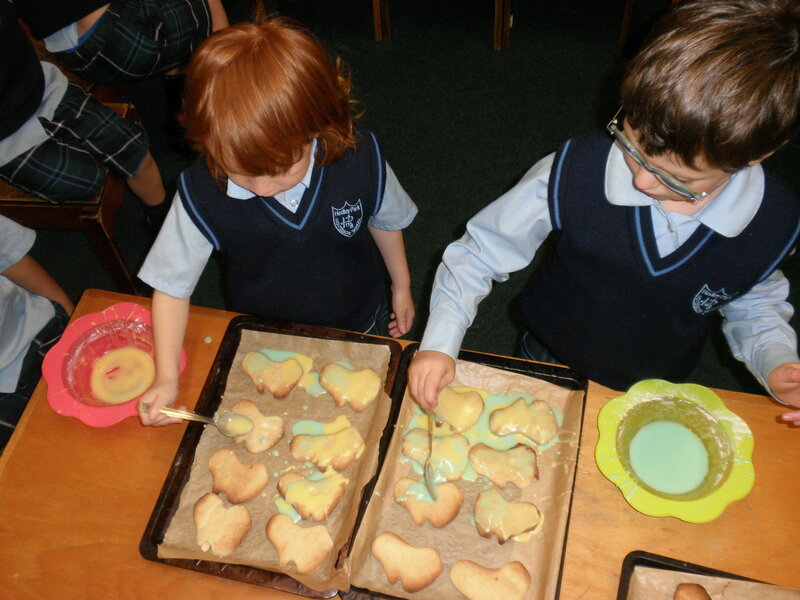 Here they are hard at work decorating their own biscuits. ............bet they will be yum! After all that cookie making, rolling, cutting and icing I can only imagine there was lots of contented smiles as they enjoyed the best bit…. eating! Congratulations Junior Infants, we are very proud of you all. Come back soon for news from Senior Infants and First to Sixth Class. It has been another great week in the nursery, hard to believe we are into the latter half of our first month back. We are all truly settled now and enjoying the return of our extracurricular classes. Ballet on Tuesday was much anticipated by all our budding ballerinas. While it does give our petite prima donnas a chance to don their fantastic pink tutus and wraps, it’s not just the girls that benefit. Ballet refines the gross motor skills of boys and girls alike. Rhythm, music, movement, balance and coordination are all core aspects of the senior nursery ballet classes. Drama on Wednesday is a roaring success, quite literally! The return of Esther saw the junior and senior nursery class visit “Chocolate Land” and “Monkey Land” they all drew their tickets, packed their cases and boarded the imagination express to explore the wonderful lands. Music on Fridays is always a treat. Especially this year as we will be gearing up for the Big 20th Anniversary Christmas Musical. Keep in touch for more news on that! Even with all our great extracurricular classes we had more than enough time to get into our Montessori curriculum. 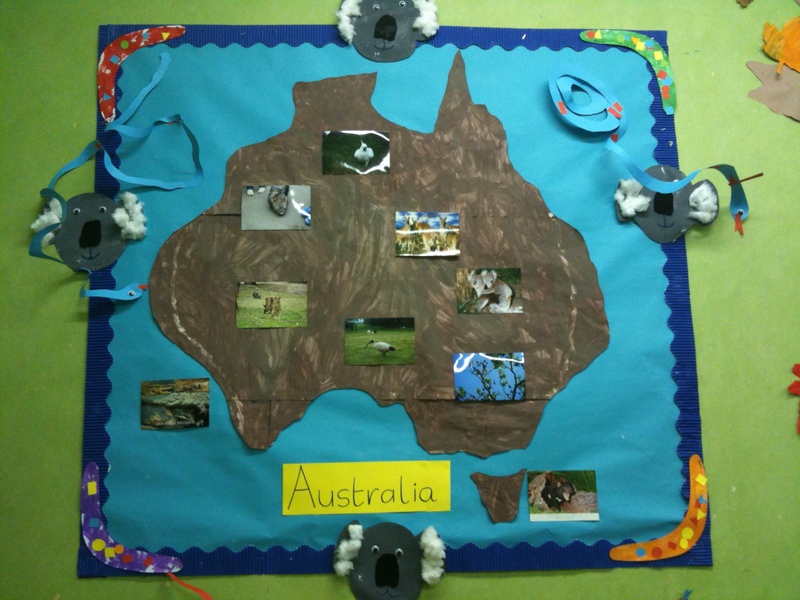 The junior nursery class are really immersed in the culture and animals of the Australian Continent. They started by painting the continent it’s Montessori key colour brown. Once that was done they began to add their cultural art items. Including the cutest Koala Bear’s, some pretty dazzling boomerangs and spectacular snakes! We were all very proud of our new nursery juniors, who range in age from 2yrs 2 months to 3yrs. 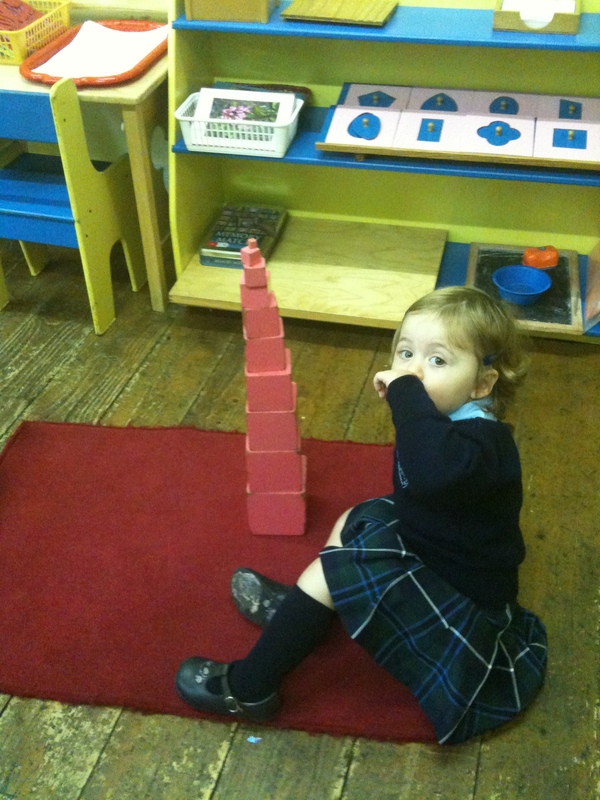 This week one of our youngest students completed the first in the sensorial curriculum, the pink tower. It really is a great moment to see a child understand and internalize the lessons of the Montessori materials, as each lesson builds the child’s confidence and cognitive abilities. The pink tower is a beautiful material, and gives so much to the young learner. There are 10 cubes in graduated dimension from 1cm to 10cm. In carrying and sorting, grading and building the tower the child develops coordination, concentration alongside visual and sensorial discrimination of size. Our “big school buddy” Emma came to visit on Thursday and she began a new literature project with the junior nursery class. The Gruffalo. If you havent read Julia Donaldson’s classic children’s tale, get to your local bookstore quick and enjoy it for yourself. 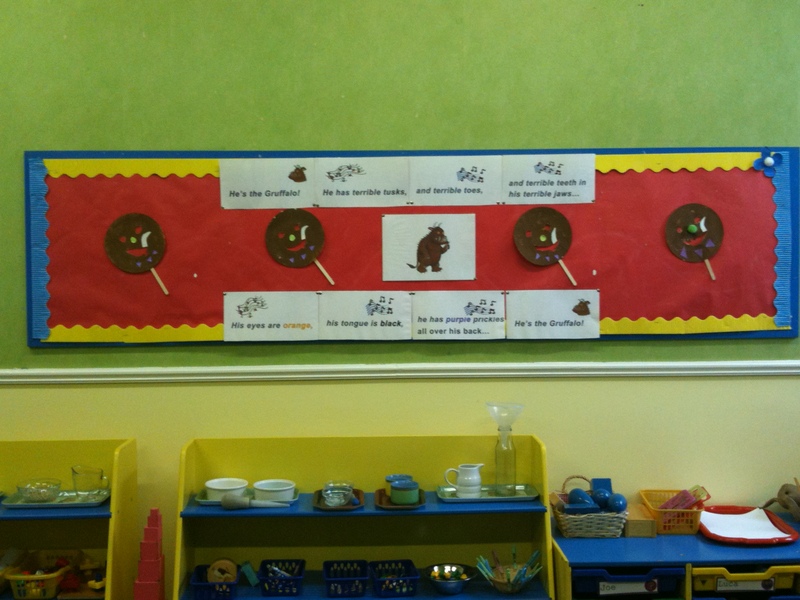 Emma brought a fantastic Gruffalo pop up theatre book and we recreated the story as we listened to the Gruffalo song. Then everyone made their own Gruffalo mask, complete with prickly purple spines and tusks! Have a look below, click on the image to zoom in and see all the detail. With all the news from the Junior Nursery Class, lets not leave our Senior Class out of the updates. We are still continuing on our Asian expedition. Now you see it..... soon you wont! This week we made sushi. Many hands did indeed make light work, both of the creation and the consumption of our sushi. It vanished so fast we hardly had time to take photos. 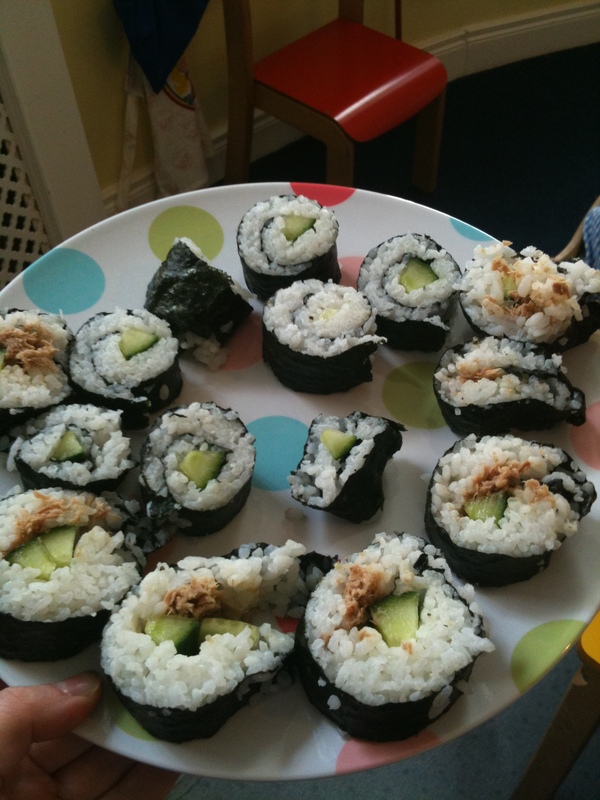 Everyone enjoyed spreading the rice on the nori, laying the cucumber, mango or tuna and rolling the maki. Then we all enjoyed a piece with our lunch, accompanied by pickled ginger, soy and some even ventured towards the wasabi. A real treat for our developing taste buds. Next week we hope to explore the beauty and diversity of Asian architecture. Come back at the end of the week to find out what we discover. 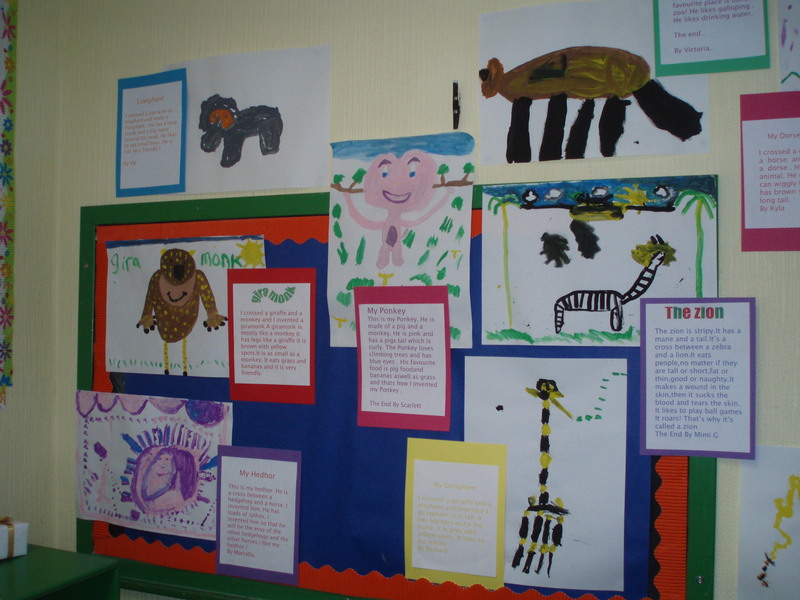 Not to be outdone by our little neighbours in the junior class, the senior class have been creating their own fantastic interpretations of the animals of Asia. 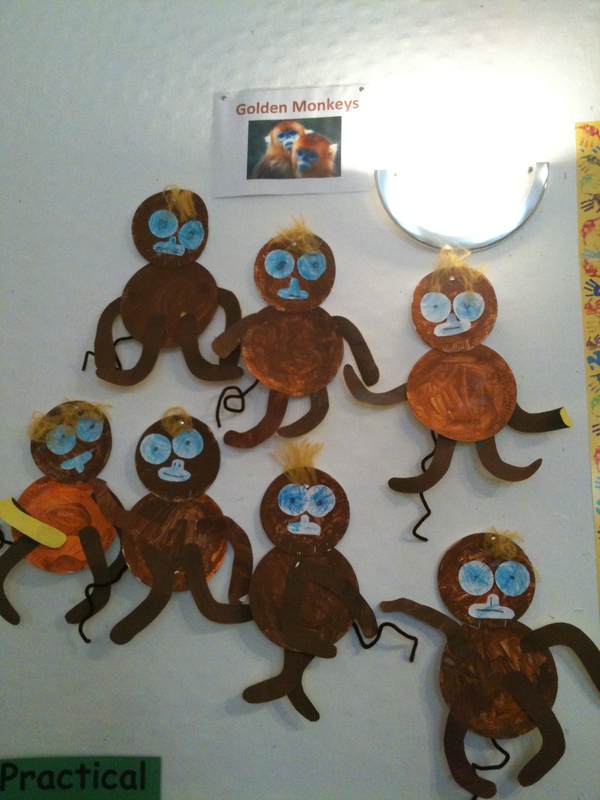 Our chosen animals are the Golden Monkey and the Giant Panda! 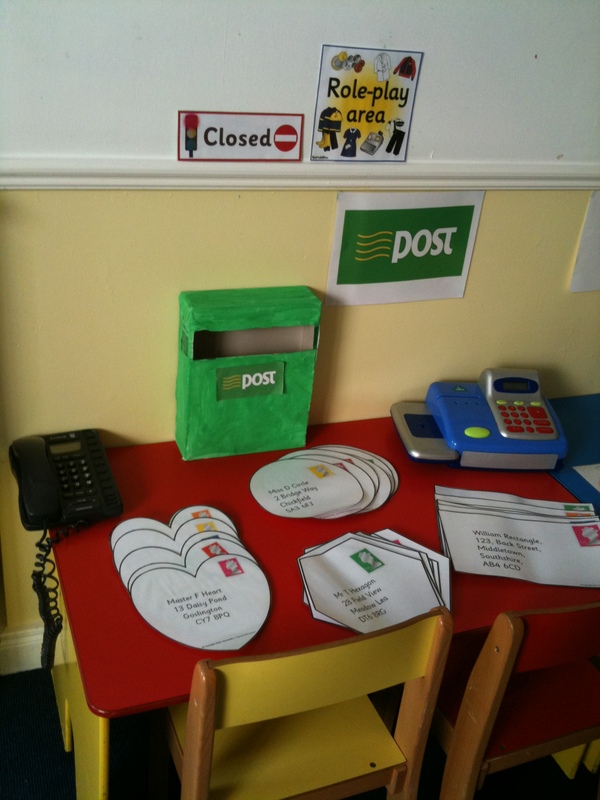 We also began our Role Play area this week with the Post Office. Role Play is important for young children. Role playing encourages the use of critical thinking Participation in role-play allows students to make decisions, and through the feedback received, see the results of their actions, and can therefore learn how to adjust words and actions to produce more successful outcomes. It also teaches many lessons that are needed in society, such as competition, cooperation and empathy. The Post Office is a great hit and we will be expanding its tasks this week. So far we have been posting letters, emptying the letter box and sorting the post for delivery. We have two functions of sorting, either by shape or by stamp colour. We take turns posting, collecting and sorting. Children work in pairs at the role play area and everyone ensures they get their time to get into the role. In the coming days we want to create our own postcards and take them to the local post office to send to friends and family as a keepsake of our time in the Nursery. Before we do, we have to practice our stamp buying, and our post office etiquette in our role play area. It is with that note, that we await the beginning of a new week in Hedley Park Montessori, I wonder what we will learn this week! Thanks for popping in to catch up, if you have something to tell us feel free to comment. We’d love to hear from you. You are also welcome to share our posts with your family and friends by using the buttons below, for Facebook, Twitter and regular email. From all the staff and pupils of the little school!